Please add the personalization that you would like to include on your item. This custom cheese board set comes with four stainless steel serving utensils including knives, forks, and spatulas. Each tool has a matching bamboo handle. This lovely cheese set is the perfect serving piece for your all your entertaining events or as the perfect gift to make the perfect memory! HOW TO ORDER – Be sure to select the specific verse that you would like from the drop-down menu. Each verse and design are shown in the photos. If you would like for us to create your own design, please choose that option from the drop-down menu and follow the additional directions. 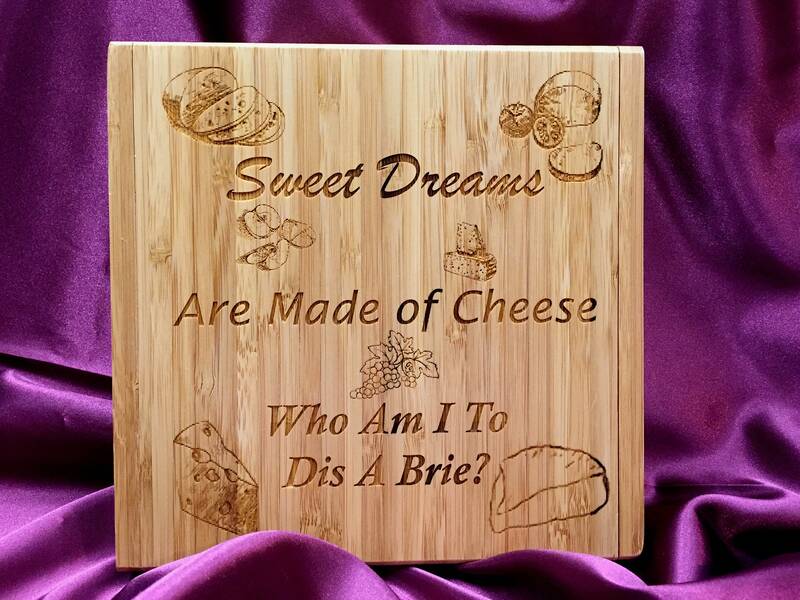 You may also choose to have a custom message engraved on the bottom of the box. If you would like, then please select this option. CUSTOM DESIGN: If you would like for us to create your own special item, simply choose the option from the drop-down menu. On the check-out screen, you will see a box to send a note to the seller. Simply type in the verse you would like and any other special instructions. You will receive a proof of your design before production begins. NOTE – Please be aware that each item is unique since it is made from natural material and will have its own personal characteristics of coloration. Irish Flask, St. Patrick's Day Flask, Hip Flask, Engraved Flask, Custom Gift for Anyone! More Irish Flask, St. Patrick's Day Flask, Hip Flask, Engraved Flask, Custom Gift for Anyone! Ordered this to announce the arrival of our baby to my brother. Love it!! Great quality, and came quick! Highly recommend. Personalized Engraved Leather Keychain! Perfect Gift For Anyone! Includes Gift Box and FREE SHIPPING! Beautiful! Just what I ordered and shipped quickly before Christmas! Great communication and service. Would buy from again. I recently ordered a personalized pizza stone as a Christmas gift and it was absolutely beautiful! I am so pleased with how the product turned out! Sandra was so great to work with and answered any questions that I had so quickly! I definitely recommend this shop for anyone looking to give a gift with a nice personalized touch! If you received a damaged or incorrect product you have 3 days to let us know about the issue. If the mistake is our fault, we will remake and reship your replacement item ASAP. Refunds will be issued for damaged items, only if insurance is purchased. All merchandise must be returned with original packaging and documentation WITHIN 15 DAY. All items will be sent by U.S.P.S. Shipping quotes are based on flat rate but we will always charge less if your zip code allows. Since each of our gifts is a personalized piece of art and many are made with materials of nature, no two are ever identical. We have taken every effort to make an accurate representation through photographs and description.